Dexter’s bedroom has been a project over the past year. The room itself started out as Neil’s bike room. We decided when I was pregnant that we would co-sleep and felt in no rush to ship Neil’s bikes out of the way and get started on a nursery for the baby. When Dexter started rolling, it was becoming obvious that he needed his own space where he could play. The project began and we started rearranging our living space to we could squeeze the bikes in and free up the room for Dexter’s crib, wardrobe and changing station. As the months have rolled by, our co-sleeping journey has ended and the room has turned more into a bedroom than a nursery. For his first birthday, we bought Dexter a teepee and I think that has pretty much completed the room except for one thing- a great piece of art on the wall. Shepherd Illustration recently got in touch and asked us if we’d like to receive a print and it wasn’t hard for me to pick my favourite. Lauren Shepherd is a motion graphics designer, illustrator and dachshund mom based in Newcastle-Upon-Tyne. Her website describes her illustrations as “delicately macabre but filled with romance“. 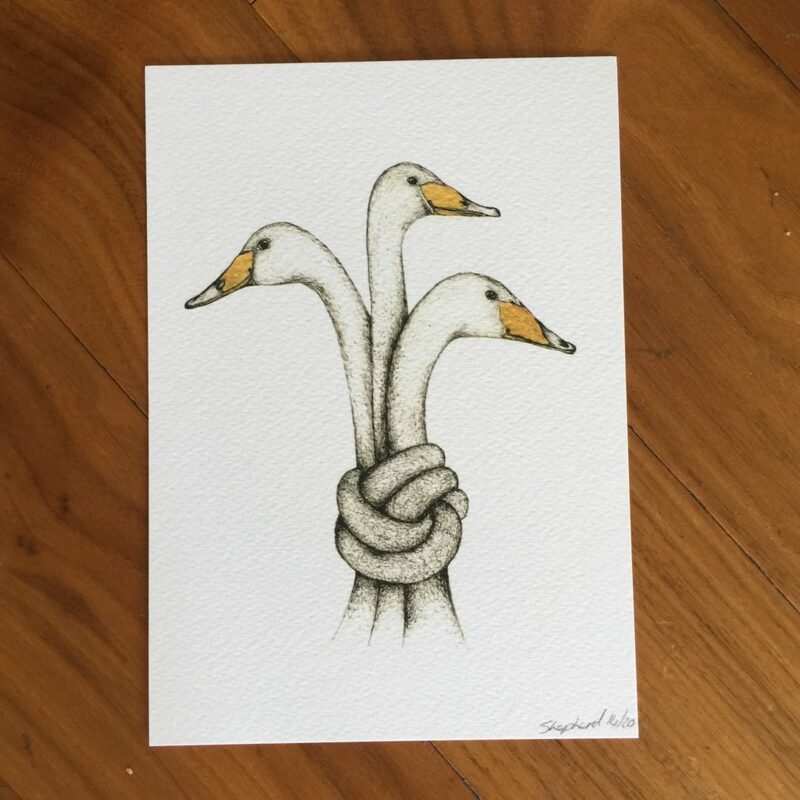 For me, the print of the three geese stood out straight away, not just because of how amazingly they’re drawn, but because ‘Goose’ is the nickname Neil and I use for each other and Dexter, and the three of them together really does symbolise our little family unit. Not only does Lauren do prints, she had a fantastic selection of greetings cards on her Etsy page starting from as little as £2. They are beautifully drawn using black fine liners before being digitally gilded using photoshop. 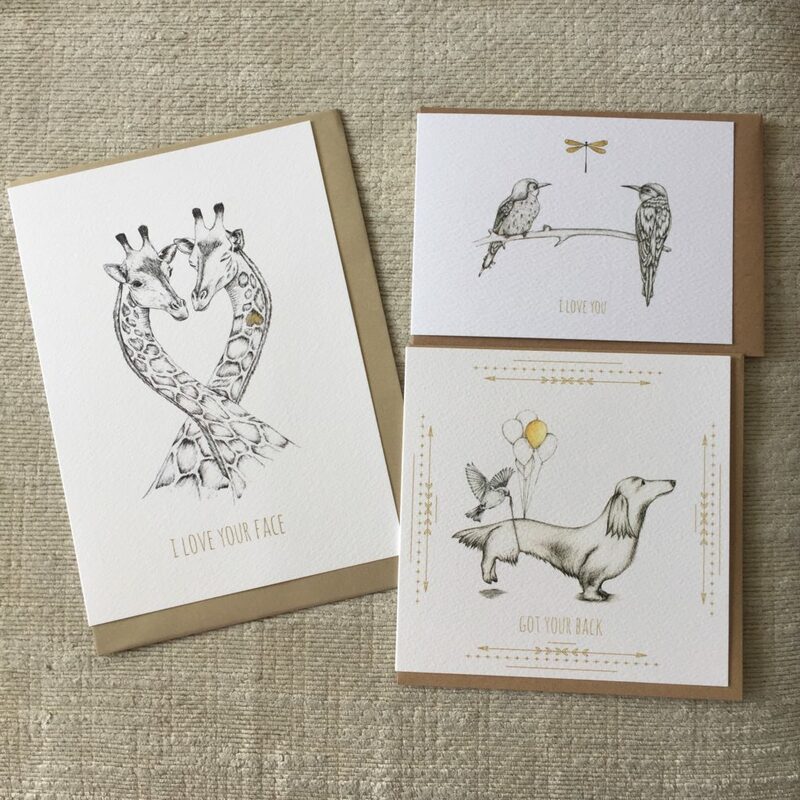 The cards are made from 300gsm pure white card and come with a recycled kraft envelope: beautifully drawn and environmentally friendly! The three geese print really does complete Dexter’s bedroom and I’m so happy to tell you guys about this wonderful artist! You can find Shepherd Illustration on Instagram and Twitter. Go check out the Shepherd Illustration website. Gorgeous artwork. I love that it’s a bit unusual, really makes it stand out. Lucky Dex!